The Social Security Disability Insurance program (SSDI) was designed to assist individuals deemed unable to work as a result of a permanent disability. SSDI has been and remains an essential component of the nation’s safety net. However, the program faces significant financial challenges and must be reformed before the SSDI trust fund is depleted in 2032. Many SSDI recipients are capable of working at least part time, but the program as currently structured discourages work. Rather than presenting SSDI applicants with the binary choice between work and disability benefits, the government should explore the possibility of temporary and partial disability awards to support increased opportunities to work. In addition, there are valuable lessons to be learned from disability reform in the United Kingdom, including perhaps the most valuable lesson, which is to recognize the distinction between disability and incapacity. 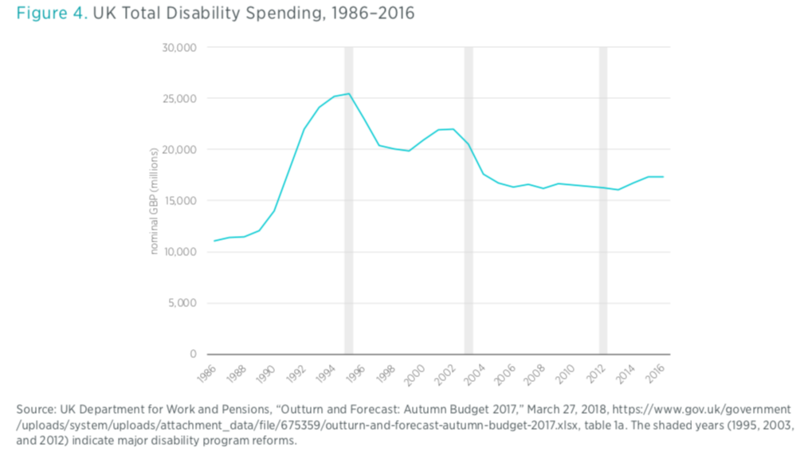 Although rates of disability have remained fairly stable in recent years, the number of workers claiming SSDI has doubled in just 15 years from 2.83 million in 1988 to 5.87 million in 2003, or from 2.3 percent of the workforce to 4 percent of the workforce. What is more striking is that enrollment has continued to climb since then, to over 5.5 percent of the workforce in 2016, resulting in federal government outlays of $144 billion per year. The cost of SSDI is expected to grow another 50 percent over the next decade alone, reaching $216 billion by 2028. In order to account for the growth in the number of insured workers, we should also consider the growth rate of SSDI applicants and awards as a share of the insured workforce. 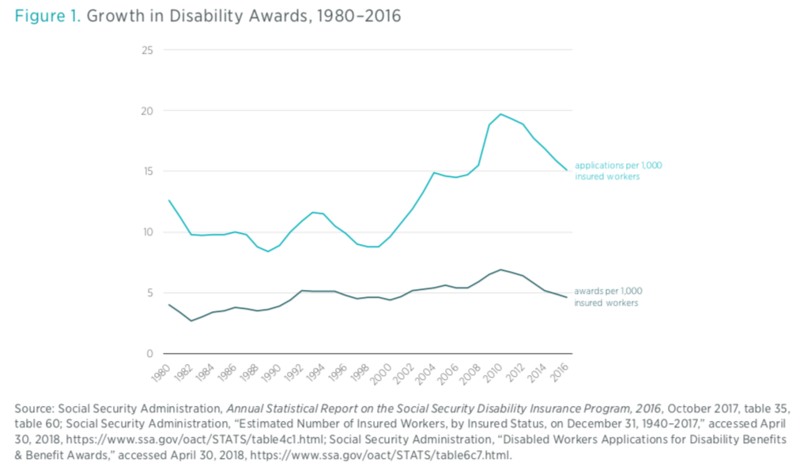 Growth in applicants and awards to disabled workers has outpaced the growth in the number of workers who have accumulated enough quarters of coverage over their working lifetime to become insured. As shown in figure 1, the rate of awards per 1,000 insured workers did not exceed 4 until 1991. After that, the trend drifted upward, peaking in the recent recession at 6.9 awards per 1000 insured workers before falling back below 5 awards per 1,000 insured workers in recent years. In 2015 Congress passed stopgap legislation that temporarily shifted payroll tax revenue from the Social Security (Old-Age and Survivors Insurance, or OASI) trust fund to pay for disability insurance (DI), as at that time the DI trust fund was facing depletion in 2016. However, considering that the DI trust fund is again approaching insolvency in 2028, shifting payroll tax receipts from the OASI trust fund to the DI trust fund is a temporary patch and not a long-term solution to the underlying problem. When considering that the retirement program is also racing toward insolvency (projected to occur in 2034), the additional pressure of funding DI payments will only hasten the depletion of the OASI trust fund. The Social Security Disability Benefits Reform Act of 1984 changed the screening criteria and directed the Social Security Administration (SSA) to give additional weight to subjective factors when making its disability determination decisions. Coupled with the use of medical-vocational guidelines, the result was a drastic and disproportionate increase in awards to beneficiaries with hard-to-determine disabilities, such as musculoskeletal conditions and mental disorders. As shown in figure 2, these two diagnostic groups made up more than 50 percent of total disability awards in 2016. An applicant’s eligibility for SSDI is determined using the “medical-vocational grid.” Applicants are deemed eligible depending on their age, education level, skills, and language ability. These guidelines apply much looser standards for applicants who are 45 years old or older than for younger applicants, and they are an important part of the explanation for increased disability awards in recent years. 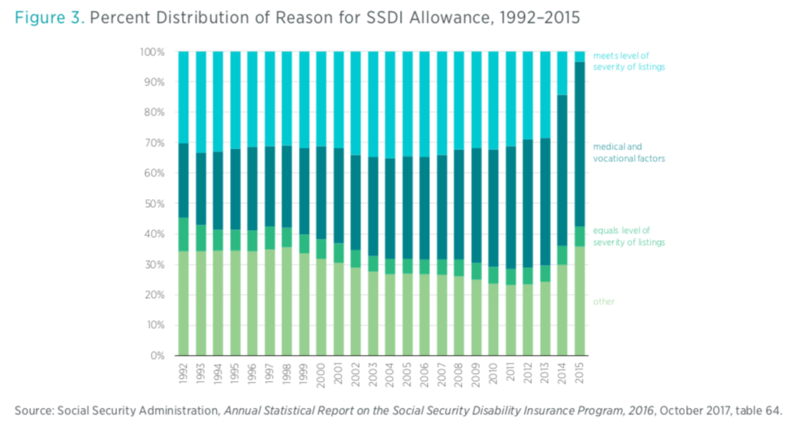 Figure 3 gives the reasons for SSDI awards between 1992 and 2015. The DI adjudicators must check whether the disability claim either equals or meets one or more of the listed impairments. If the applicant does not meet the criteria, then adjudicators consider a combination of the applicant’s functional capacity to hold a job and the applicant’s medical condition. 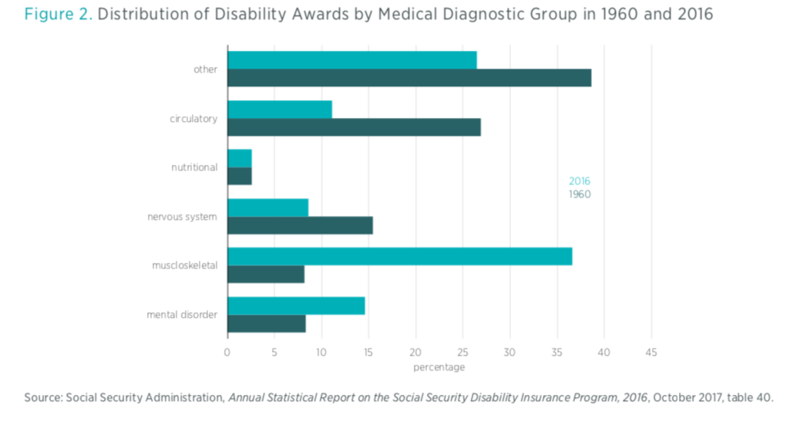 As can be observed, an increasing share of SSDI awards over time has been given in this medical and vocational factors category. Under these guidelines, workers below the eligibility age for retirement benefits may be found to be disabled if they have a history of unskilled work or work with skills that do not transfer to other work. The guidelines therefore create a potentially perverse incentive for those near retirement unable to find work to seek disability benefits instead of continuing to seek employment. The loose standards of the medical-vocational grid also lead to increasing numbers of eligible beneficiaries, as many types of ailments qualify despite debatable medical evidence. In addition to these flaws in the determination process, the medical-vocational grid wrongly assumes that all work requires physical exertion, failing to consider that the nature of the workforce has changed in recent decades. The increased use of medical-vocational definitions of disability has led to an increase in workers of advanced age claiming disability insurance since 1990, regardless of increasing life expectancy over the years. Workers age 50 and above now make up 75 percent of beneficiaries, and with more baby boomers qualifying for SSDI, this age group is only set to expand further. The current medical-vocational guidelines are designed for conditions that existed decades ago, not for the economy and workers of today. Instead of incentivizing disabled workers to reenter the workforce, the SSDI program contains an array of provisions that make it difficult for those who are willing and able to test their capacity to work to return to or remain in the workforce. For example, if SSDI beneficiaries earn more than the substantial gainful activity level determined by the SSA (currently set at $1,180 per month), they stand to lose their entire SSDI benefit. This sharp cash cliff represents a serious disincentive for beneficiaries who may desire or attempt to work. This all-or-nothing assessment and determination of SSDI beneficiaries does not reflect the reality that many with disabilities are capable of and willing to work. In order to continue providing a vital safety net for disabled Americans, the SSDI program requires reform that better reflects the reality that, for many, disability is not an unyielding condition that completely prohibits work. These reforms should include the administration of a temporary disability award program that allows partial benefits and requires mandatory continuing case reviews. Pilot projects should be rolled out at the state level to test these proposals and provide rigorous empirical evaluation ahead of applying changes at a national level. The main goals of program design should be to support increased opportunities to work and save, while lowering the fiscal burden of unsustainable SSDI program growth. Integral to the success of a temporary and partial awards system is proper funding of the SSA’s continuing disability review (CDR) for medical improvement and ability to work. This proposed system would be similar to the existing program but would also allow for partial awards, ensuring that those who can continue to work remain in the labor force. The proposed system would also have more frequent CDRs. Depending on medical improvement or decline, each review would result in increased or decreased partial awards. What’s more, a system of temporary awards changes the motivation of both the beneficiary and the CDR administrator. Determining how much a partial SSDI award should be is something that can be done through the pilot program process. While many pilot designs should be considered, a good partial award baseline should be established at 50 percent of the fully eligible award. Under this model, beneficiaries who qualify for DI will have the option to participate in the partial awards program with increased opportunities to remain attached to the labor force. The results of the pilot program would help inform administrators which types of people are most likely to succeed in remaining attached to the labor force. If encouraging, the empirical findings could be used in designing a full-scale national program whereby certain medical conditions might automatically assign beneficiaries into the partial disability awards program. In addition to a temporary and partial awards pilot process, a second pilot program could be constructed in select states with a focus on incentivizing employers to take on more responsibility for employee disability insurance. Such a proposal has been recommended by Harvard economist Jeffrey Liebman. Liebman’s proposal suggests that an employer should be provided a tax credit to offset payroll taxes whenever the employer reduces the incidence of disability among its workforce by at least 20 percent. Similarly, a pilot program could offer firms a tax credit against the cost of premiums for private disability insurance coverage. In turn, those enrolled in private disability insurance would be prohibited from SSDI enrollment for a fixed period of time—one or two years. An employer-focused pilot program such as this would also allow policymakers to make a better empirical evaluation of the practicality of such a reform design at the national level. Unlike in the United States, disability benefit reform in the United Kingdom under successive center-right and center-left governments has been high on the public policy agenda for over two decades, starting with the replacement of Invalidity Benefit with Incapacity Benefit (IB) in 1995. The reforms of 1995 indexed any increase in disability payments to the rate of inflation. More importantly, these changes also included an “all work test,” meaning an individual worker would be assessed according to their ability to do any kind of paid work, rather than work deemed appropriate based on their skills. This new medical screening was not conducted by the personal doctors of the worker but carried out instead by medical staff at the regional level commissioned by the scheme’s administration. Incapacity benefit could also not be claimed in addition to the state pension, so many claimants age 65 or over moved off of Incapacity Benefit and onto their state pension. The reforms that followed in the early 2000s involved pilot schemes, such as the Pathways-to-Work program. These demonstration programs compelled disability recipients to attend interviews on managing their health conditions in ways that might allow them to reenter the workforce. In 2008, Incapacity Benefit was replaced with the Employment and Support Allowance. This new disability benefit consolidated all previous disability-related benefits into one payment and further refined eligibility criteria. The new health assessment divided claimants into (1) those deemed to have limited capacity to work but able to follow work-related activities and (2) those who have limited capacity to work and no ability to follow work-related activities. Those in the first group are required to attend regular interviews and discuss job goals and skill enhancement under the Pathways-to-Work program. More recently, these back-to-work pilot programs were extended, and determination criteria were further strengthened under the Welfare Reform Act 2012. The broadly successful disability reforms undertaken in the United Kingdom were only possible because policymakers acknowledged that changes in behavior, not changes in health, were driving unsustainable program expansion. British policymakers recognized an important fact that allowed them to implement fundamental disability policy changes—disability is not the same as incapacity. As shown in figure 4, UK disability spending peaked in 1995—since that time, disability caseloads have been on a downward trajectory and costs as a share of GDP have almost halved. 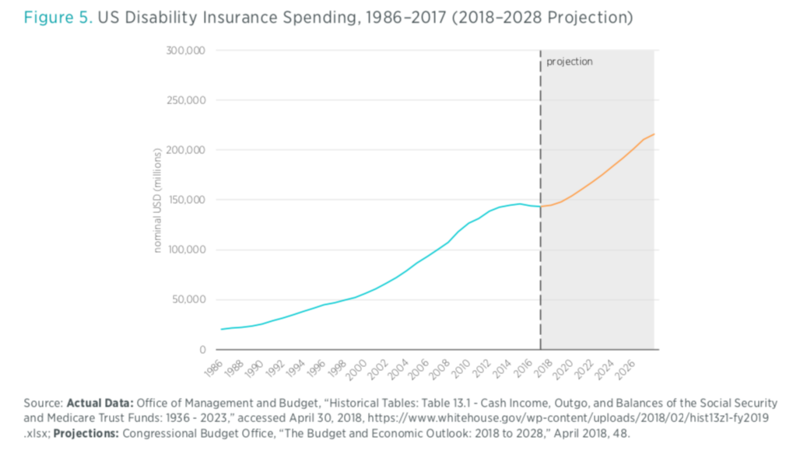 During this same period, disability spending in the United States has continued on an upward trajectory, with costs projected to grow significantly in the coming decade (see figure 5). Ultimately, the medical-vocational grid guidelines used by the SSA should be eliminated and replaced with a fairer, simpler, and more uniform system for determining eligibility. A subset of workers with disabilities have disorders so severe that work is impossible, but these workers represent a smaller proportion of disabled claimants than is often recognized. Although this notion is at odds with the current SSA system of definitions and requirements, recategorizing subsets of disabled beneficiaries as either able to follow work-related activities or not would allow policymakers to install incentives and back-to-work opportunities for those who are deemed capable. By using the experience in the United Kingdom as an example to follow, SSDI demonstration programs should be implemented at the state level with a focus on temporary and partial awards, as well as incentivizing employers to take on greater responsibility for employee disability insurance. With SSDI program funds facing insolvency in the coming decade, policymakers can no longer delay serious reforms of the SSDI program.